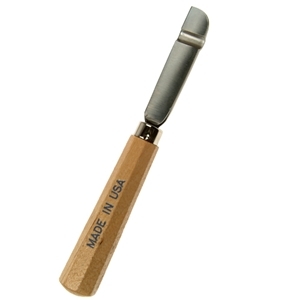 With traditional Italian styling and attention to detail,our mold making key knife is the perfect tool for creating channels while cutting/separating a silicon mold from its modeled piece. The channels will allow the silicon mold to be put back together with strong interlocking sections preventing slippage. The blade is attached to an octagonal-shaped handle so the tool will not turn or twist while working. Use your imagination - the key knife is not limited to mold making and casting but can be used with clay and wax.